As a newly appointed Marriage Celebrant, I noticed that very few brides received wedding keepsakes or good luck charms on their wedding day. Today, even at formal wedding ceremonies including all the usual trimmings, I notice that many brides still do not receive any good-luck charms or keepsakes. Furthermore, at more informal ceremonies, although the setting is relaxed and laid-back, only sometimes do brides receive any keepsakes or good-luck charms from family or friends. I wonder if many people know about the tradition of giving wedding keepsakes or charms to the Bride for good luck? Different cultures use different charm shapes as symbols of good luck. A horseshoe shape is popular. Carry the horseshoe with the ‘arms’ turned upwards. This prevents the ‘good luck’ from spilling out! Carry the horseshoe with the ‘arms’ turned downwards, the good luck is said to spread everywhere the Bride walks. A miniature shoe or slipper shape is also a popular wedding favour. Also, place a coin in the shoe or slipper for extra good luck! Tiny locks and keys are attached to the bridal bouquet. These little ‘love locks’ make delightful decorations. Furthermore, they are also safer than attaching a padlock to a bridge or other public structure! Another kind of attachment to the bridal bouquet is that of miniature portrait charms of family members who are not present at the ceremony. These may include loved ones, who although having passed away, are present, honoured and loved. I make special wedding keepsake favours or charms for very important Brides. Book Glenda, the Really Good Brisbane Celebrant, and you are a VIP, very important Bride! All brides should have at least one good-luck wedding favour or charm, and so I make my signature satin hearts. No two hearts are the same! I decorate each heart to compliment the style and colours to appeal to the bride. I give these unique bridal favours to Brides after the ‘Declaration of Marriage’ as good-luck keepsakes to take into their married life. These truly are unique wedding mementos for Brides that I make with love and care. These ‘love hearts’ are not for sale! 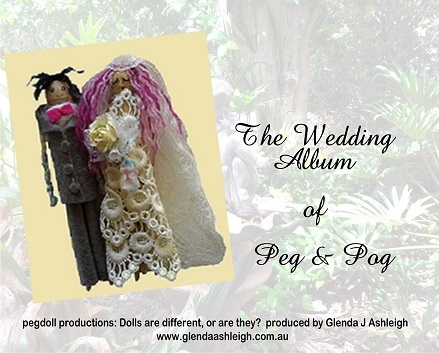 Book Glenda J Ashleigh, Brisbane’s Very Good Celebrant to get your special bridal favour! We particularly enjoyed how Glenda made us all feel relaxed about our wedding ceremony. We will always remember the ease in which the wedding ceremony was performed and Glenda's sense of humour in a trying time. We would like to tell other people to book her! You will not be disappointed! Glenda went above and beyond for us! Gold Coast Wedding Ceremony We particularly enjoyed how Glenda made us all feel relaxed about our wedding ceremony. We will always remember the ease in which the wedding ceremony was performed and Glenda's sense of humour in a trying time. We would like to tell other people to book her! You will not be disappointed! Glenda went above and beyond for us! We were fortunate to have Glenda assist us over a 2 year period prior to our wedding, with laws and regulations in visa matters. We were not up to date with requirements but Glenda attended to everything very professionally. We were very lucky to find Glenda! We enjoyed that Glenda kept it simple and fun. Just like we had asked. It was an amazing afternoon. We received good feedback from our guests regarding how much they enjoyed the ceremony and the lunch reception at Shangri La. Thank you Glenda!